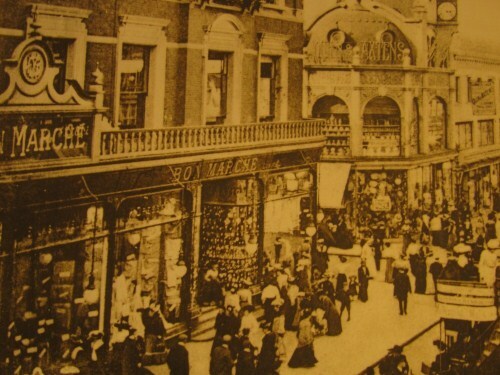 The Bon Marché was started by Mr. James Smith of Tooting. He was a printer and the proprietor of the "Sportsman" newspaper. Mr. Smith owned a racehorse called Roseberry, which in 1876 achieved a unique double of the Cesarwitch and Cambridgeshire stakes at Newmarket. He decided to invest the proceeds in commerce to provide a secure future for his sons. 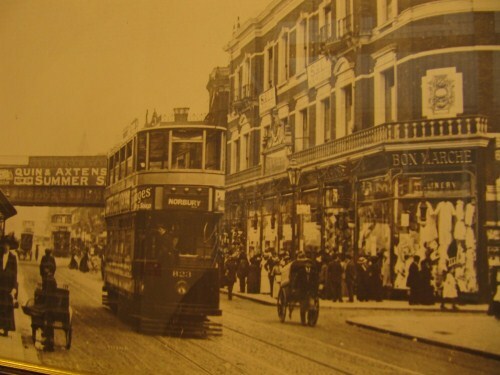 He bought some land near Brixton Hill which had been a nursery garden for some years; 1876-1877 Mr. Smith built the first purpose built department store in the UK, naming it after the original Bon Marché in Paris. A quote from "the Builder" magazine reads: the 100,000 sq ft Bon Marché Building is the first steel frame building in the UK, opened its doors in 1877. "The large and handsome new market building is estimated to have cost at least £70,000 exclusive of land. The buildings have been erected and internally arranged on the principal of some similar establishments in Paris and when opened they will form a novelty in market accommodation in the metropolis, embracing the sale of almost every imaginable article of food, furniture and dress, under one management, the whole of the employees residing near the premises in a large block (Toplin House - now The Department Store) 240-250 Ferndale Road which was specially erected for the employees and has a direct internal connection to the main Bon Marché building two tunnels under Ferndale Road, one for men the other for women." Little is known of the earliest years trading. It was an ambitious project, perhaps too ambitious, for in 1892 Mr. Smith was in the bankruptcy courts with debts of £71,000. The business was saved by five businessmen who made it a public limited company, Bon Marché Ltd, with a capital of £120,000. They ran a successful and flourishing business for 34 years. 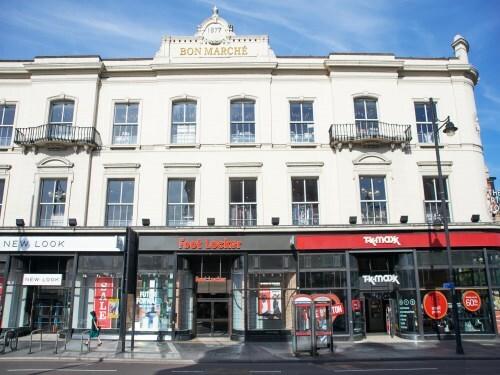 In 1901 an arcade was constructed at the front of the shop and in 1909 the whole Bon Marché building was fitted with Grinell fire sprinklers at a cost of £1,500. The success of the business attracted the attention of Mr. Selfridge Jr. and in 1926 he gained control and it became one of the Selfridges Provincial stores. In 1940 the John Lewis Partnership bought the Bon Marché Department store along with other Selfridge Provincial Stores and traded as Bon Marché up to June 1975. In May 1941 The Bon Marché building was hit by a bomb which gutted a substantial part of the upper floors and caused damage by flooding from burst sprinkler pipes. The building was able to open for restricted business the next day but parts were closed for longer and the top floor remained unused for ten years. 1975 John Lewis Partnership made a commercial decision to cease trading in stores below 200,000 sq ft which included the Bon Marché building. 1977 The freehold of the Bon Marché building was sold to Bullion NV, a Dutch firm. 1977 / 1981 The lower floors were used as a retail indoor market but the use of the upper floors was prohibited due to fire department regulations. User groups were "Superama" 1977, "The Bon" 1979 and "Brixton Fair" 1981. 1981 / 1983 The building was closed. 1982 The freehold was purchased for £1,000,000 by British American Tobacco Industries (BAT) as part of their community affairs programme involved with the regeneration of inner cities. 1983 / 1984 The building was completely refurbished at a cost of £3,100,000 and developed as a centre for retail, offices and studios. 1984 / 1986 Sherman & Waterman (Retailers) leased the ground floor and lower ground floors. It was an ambitious 70 unit indoor market retail project, perhaps too ambitious for, in 1986 with losses in excess of £1,000,000 Sherman & Waterman surrendered their lease back to BAT Industries. 1986 / 1988 BAT Industries took over the management of the retail indoor market, after continued losses in the retail section in excess of £1,000,000 BAT Industries approached Lipton Retail Consultancy Company. 1988 Lipton Retail Consultancy Company (LRCC) leased the ground and lower ground floors and developed the retail floors on an open plan department store format and used concession tenancy agreement tenure (percent of takings) to attract retailers to Brixton, Lipton Optical, Top Shop, Top Man, Dorothy Perkins, Evans, Panache Lingerie, Champion Sports, Sports Division, and Barratt Shoes, to name a few, the retail concession business was very successful and started the regeneration of Brixton Town Centre. 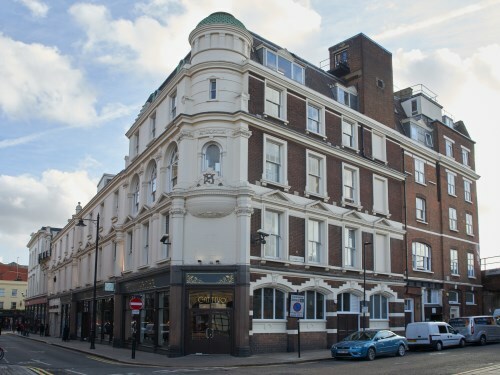 1994 BAT Industries having achieved their objective of starting the regeneration of Brixton Town Centre and with cumulative losses £5,900,000 decided to sell the Bon Marché building. 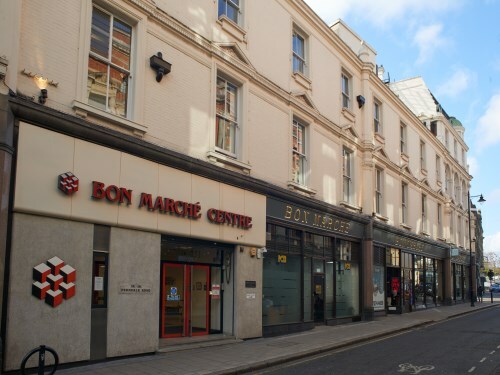 1995 August LRCC purchased the freehold of the Bon Marché building; the Bon Marché Centre Limited is a wholly owned subsidiary of Lipton Retail Consultancy Company Limited which is a privately owned family business which self finances its developments. 1997 LRCC carried out a retail development to create three self contained large shops on the Brixton Road frontage and five self contained shops on Ferndale Road. 2005 - 2007 LRCC developed the business centre ground floor reception area, the rear part of second, all of the third, fourth and fifth floors were refurbished, including the installation of air conditioning to offices. The business centre has 70+ units ranging from 100 sq. ft. to 700 sq. ft. There are over 60 businesses in the business centre on a tenancy at will tenure agreement. High-speed fibre-optic cabling was made available direct into all offices in the business centre. 2011 - 2016 LRCC converted part of the Bon Marché building back to its historic retail use by redesigning the shop frontage and interior; installing four escalators and two lifts to service the front part of the lower ground, ground, first and second floors; increasing the retail selling and ancillary space and attracting top retailers to Brixton - New Look, TK Maxx, Cabana Restaurants and Foot Locker.